Enoch, UT 24th of July Pioneer Day Celebration - For the first time since 1981, the Enoch Orchestra once again provided traditional music and dance instruction at the annual Pioneer Day festivities. 140 guests went back in time to the 1850's to experience life at Fort Johnson and learn of Enoch's early history on Dec. 16, 2017. Worth Grimshaw gave an outside tour of the Fort, explaining the early history of Iron County and the settlement of Enoch by Joel Hills Johnson. He showed the locations of the fort walls, the well, orchards, cottonwood trees, the blacksmith shop and the two look out towers. Later it was also noted that Joel H. Johnson wrote over 50 of his 1000 songs and dozens of his Shakespeare Of The West poems while at Fort Johnson. The most famous of his hymns is "High On The Mountain Top" which was sung, portrayed and spoken of at the Youth Celebration and Dedication for the Cedar City Temple on Dec. 9 and 10. Following the tour of the Fort, a great reunion of neighbors and friends was hosted inside by Glenda Grimshaw. Over 40 Christmas trees lined the reception areas and brought a peaceful Christmas wonderland to all who attended. In the upper level, 100 guests received historical narrations and an old time performance from the historic Enoch Orchestra. In memory of Enoch carolers who sang to neighbors from hay wagons, the orchestra and choir performed, Here We Come A Caroling. 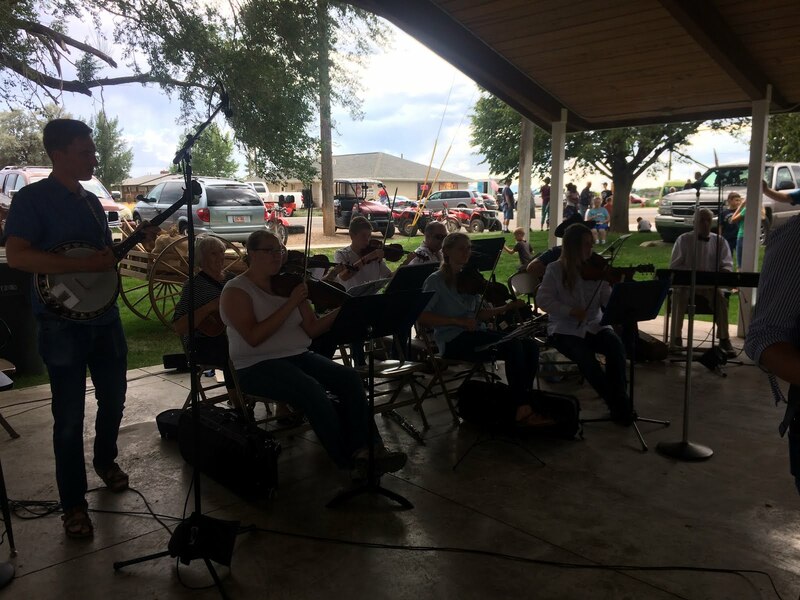 To remember the Iron worker John Lee Jones who was the first fiddler in the Enoch Orchestra and who spun his own wool for clothing, Old Spinning Wheel was played. Turkey In The Straw was next to remember the 1000 turkeys in the fields around Enoch. Other Christmas carols that were beautifully performed by the orchestra and choir included, Silent Night, Bring a Torch Jeanette Isabella, The Holly and the Ivy, Once In Royal David's City, and We Wish You a Merry Christmas. In honor of all who used to dance the waltz or still can, Golden Slippers was performed while Megan Shields tap danced a thrilling rhythm cheered by all. 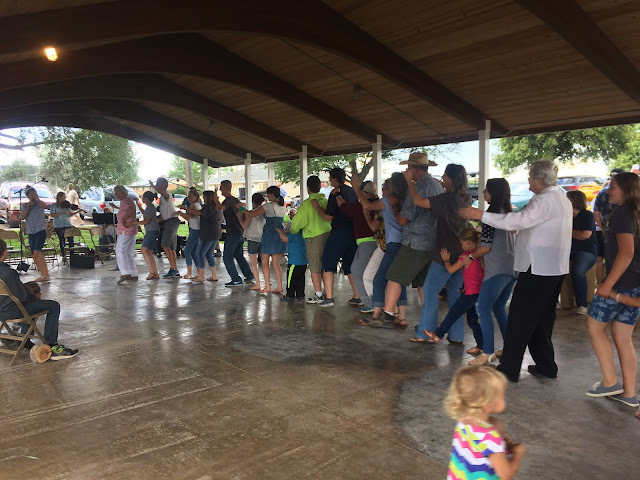 In memory of the Old Log School which served as the school, church, cultural hall and theater, the guests enjoyed sounds of Log Cabin Quadrille. William H. Grimshaw had started the Enoch Orchestra in the Log School in 1908 as a brass band. Myron Jones and his sister Grace Smith developed it into a dance orchestra with waltzes, polkas, quadrilles and shottisches. Some attendees remembered Myron Jones' violin and George D. Grimshaw's banjo. 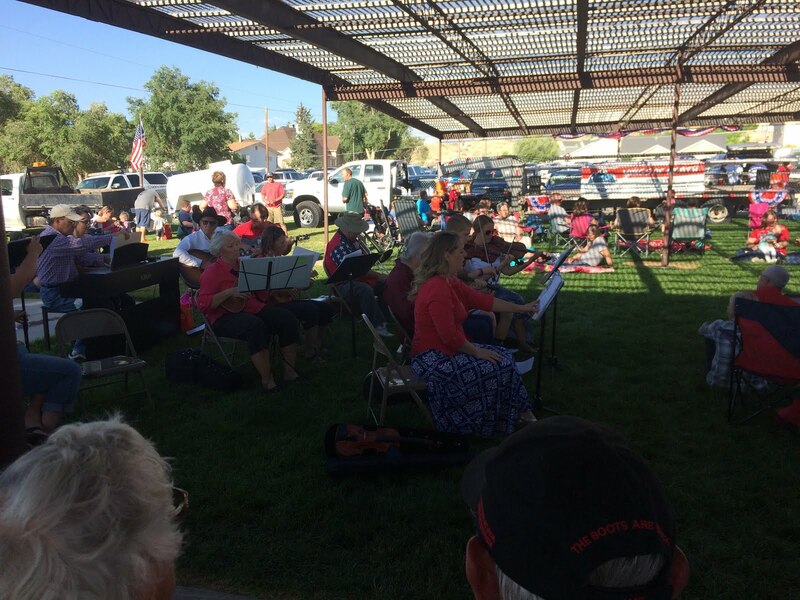 They played for 75 years in the Enoch Orchestra. Enoch historian Rose Ina Grimshaw recorded stories of Native Americans at the Fort including 6 Paiute boys named Merricats, Comanch, Squint, Curly Jim, Tomat and Captain Pete. Also a 10 year old girl named Verogue lived at the Fort. To honor them, the nostalgic strains of Little Indian Maid Quadrille were shared. Other orchestra favorites were 5 foot 2 and Let Me Call You Sweetheart. Many early residents found their sweethearts while at the Fort. In honor of the Spanish Explorers Fathers Escalante and Dominguez, who established the Spanish Trail through the area, The Spanish Waltz was played. After the performance, guests summed up the evening by saying they came and received the Christmas Spirit they had hoped for. As historian Estella Jones wrote, "All holidays at the Fort were celebrated in a fitting manner". 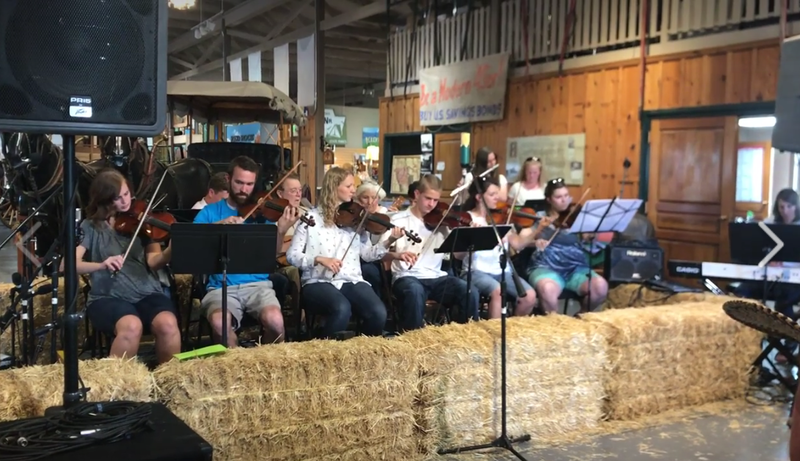 The performers in the attached Enoch Orchestra photo are from left to right 1st row: Patti Davis, Megan Shields, Amy Matheson, Bethany Alger, Melissa LeBarron, Trevor Sanders, Brooke Sanders, Malorie Hunt, Andrea Jones, Laura Melling, Kelsey Sanders. 2nd row: Brad Nicholson, Angie McArthur, Linda Wilson, Adam Grimshaw, Jordan Maxwell.